Here is the next installment of the WQC Practice sets. I hope you are enjoying them. 1. 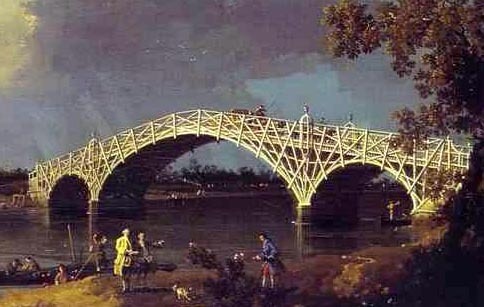 (Pictured) Completed in 1754,this painting entitled 'Old Walton Bridge',shows two prominent figures to the left-centre. Furthest left (and wearing a yellow coat) is Thomas Hollis,the man who commissioned the work.Standing next to him,immediately to his right,is the artist that painted the work.What is the artist's name? 2. In Norse Mythology,it is a place where the survivors of Ragnarok are foretold to live.Mentioned in the Prose Edda and Voluspa,it is described as the 'most beautiful place on Earth, more beautiful than the Sun'. Beginning with the letter 'G',what is the name of this place? 3. Although he was Romanian,he mostly wrote in French.He was one of the leading figures of French Avant-garde theatre and the 'Theatre of The Absurd' genre.His plays include 'The Killer','Rhinoceros' and 'Macbett' ,(an adaptation of Macbeth),and his only novel was 'The Hermit',published in 1975. What is this name of this influential writer,who died in 1994? 1.During his lifetime,Zhu Di,later known as the Yongle Emperor,was responsible for the creation of The Forbidden City,The Porcelain Tower of Nanjing and the repair and re-opening of the (Chinese) Grand Canal. In which century did he live and reign? 2.He was the son in-law of Cyrus The Great and successor to Bardiya. Ruling between 522 BCE and 486BCE,it is considered that he ruled the Persian Empire during its peak.During his reign he conquered Thrace and Macedon and also began massive construction projects in Persepolis, Babylon and Egypt.What is the name of this Persian ruler,who is also mentioned in several books of the Old Testament? 3. (Pictured) A former teacher and lawyer,he was an avid supporter of Mahatma Gandhi.In 1934,he became the President of the Indian National Congress,but was later imprisoned for three years by the British between 1942 and 1945. In 1946 he became a member of the Indian interim government under Jawaharlal Nehru and in 1950 made history,when he became the first President of the Republic of India.What is the name of this man who served in this historic role between 1950 and 1962? 1. (Pictured) This woman is an American screenwriter,actress and former partner of Martin Scorcese. During her acting career she has appeared in four Scorcese films,most notably Cape Fear (1991) .She also has an acclaimed acting grandfather who won Best Supporting Actor Academy Awards,for the films 'Hud' (1963) and 'Being There' (1979).What surname is shared by this grandfather and granddaughter? 2.In 1913,the first performance of Igor Stravinsky's ballet 'The Rite of Spring' became infamous as it provoked a full scale riot. In which Paris theatre did this performance take place,and ensuing riot,begin? 3.An alternative hip-hop group,they were founded by rappers Speech and Headliner.They found global success in 1992 with hit singles such as 'People Everyday' and 'Mr Wendel', and their album,'3 Years, 5 Months & 2 Days in the Life Of...' was equally successful. Since then they have released material,but much less successful. What is the name of this group,who share their name with a US TV show starring Jason Bateman? 1. (Pictured) It opened as New Meadowlands Stadium in 2010 and changed its name in 2011. It cost approximately $1.6 billion to construct,making it the most expensive stadium ever built and is the largest stadium in the NFL, in terms of permanent seating capacity.It is also home to the New York Giants and New York Jets and played host to the 2014 Superbowl.What is the name of this stadium,which takes its current name from a New York based insurance company? 2.One of the lower ranked sides,they have only made one appearance at the African Cup Of Nations tournament,doing so in 1974.Which African national football team has the nickname 'Club M',but has also been known as 'Les Dodos'? 3.John Madden is known globally as a sports commentator and,more famously,the name used on one of the most successful sports simulations ever published. He was also the Head Coach of which NFL team that won the 1976 Superbowl (Superbowl XI)? 1.Emi Koussi is a shield volcano that lies at the south end of the Tibesti Mountains. It is noted as it is the highest peak in the Sahara,as well as being the highest peak of which African country? 2.Located in south eastern Mexico,its most famous city is the tourist resort of Cancun and its capital is Chetumal. Admitted to the Mexican Federation in 1974,which is the youngest Mexican state? 3. (Pictured) A division of General Motors,Chevrolet,has its branded vehicles represented in automative markets around most of the globe. One notable exception is in Oceania,where General Motors uses an Australian subsidiary.What is the name of this subsidiary,whose best known models include the Camira,Commodore and Monaro? 1. (Pictured) Perhaps most famously associated with Napoleon Bonaparte,it was common dress code for many officers and generals during the Napoleonic period. What is the name of this headdress,which is still used today,by the horseman of the Spanish riding School in Vienna? 2.Located on the island of Kailo near the city of Turku,this popular children's theme park does not have rides,but does have many activities and fantasy paths.Some of the features include 'The Hattifatteners' Cave','The Groke's House' and 'Snufkin's Camp'. Particularly popular with Scandinavians, what is the two-word name of this park? 3.In 2007,she became the first ever Australian to be named a Victoria's Secret' Angel'. She has regularly appeared in the Forbes' lists for highest paid models and has appeared in campaigns for large companies such as Reebok,Qantas and H&M.She was also the first pregnant model to shoot for Vogue.What is the name of this woman,who married the actor Orlando Bloom in 2010,but separated in 2013? 1.In 2013,the film 'Blue Is The Warmest Colour',won the Palme d'Or at the Cannes film festival. The film is based on a graphic novel of the same name,that tells a love story between two young women in France,at the end of the 1990s.What is the name of the author of this novel? 2. (Pictured) Billy Dee Williams portrayed him in 'Batman' (1989), Tommy Lee Jones reprised the role in 'Batman Forever' (1995) and Aaron Eckhart performed the role in 'The Dark Knight' (2008).What is the name of this supervillain enemy of Batman,whose alter ego is Harvey Dent and was based on a Robert Louis Stevenson character? 3.At the time,it was the most expensive Japanese film ever made.This 1985 film tells the story of Hidetora, a fictional 16th century Japanese warlord, who attempts to divide his kingdom among his three sons.What is the three letter title of this film,which was directed by Akira Kurosawa and based on the Shakepeare play,'King Lear'? 1. (Pictured) Occasionally known as the Alaskan grizzly,they are one of the largest bear species.They are diurnal and noted for their salmon hunting ability,but are hunted themselves, in Alaska, by humans.Named after the Alaskan archipelago in which they live,what is the common name for this bear? 2.A student and former personal assistant of Marie Curie,she was the first woman to be elected to the French Academie des Sciences,doing so in 1962.What is the name of this scientist,who was also responsible for the discovery of the chemical element Francium? 3.Sometimes known as g-strophanthin,it is found in the ripe seeds of the Strophanthus gratus plant.In France and Germany it has been used to treat heart failure,whilst in Somalia,it has been used by tribesman for hunting.What is the name of this toxic substance,which is taken from the Somali word for 'arrow poison'?